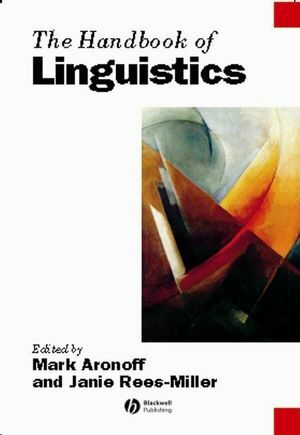 Mark Aronoff is Professor of Linguistics and Associate Provost at the State University of New York at Stony Brook. He is the author of several books and numerous technical articles on linguistic morphology. Since 1995, he has served as Editor of Language, the journal of the Linguistic Society of America. Janie Rees-Miller is Chair of the Modern Languages Department and Director of the English as a Second Language Program at Marietta College, Ohio. She has taught English as a second or foreign language for twenty years in the Middle East, England, and the United States. Her research interests include applied linguistics, second language acquisition and pedagogy, and language contact between Native American languages and English. 1. Origins of Language: Andrew Carstairs-McCarthy. 2. Languages of the World: Bernard Comrie. 3. Writing Systems: Peter T. Daniels. 4. The History of Linguistics: Lyle Campbell. 5. Historical Linguistics: Brian D. Joseph. 6. Field Linguistics: Pamela Munro. 7. Linguistic Phonetics: John Laver. 10. The Lexicon: D.A. Cruse. 11. Syntax: Mark C. Baker. 12. Generative Grammer: Thomas Wasow. 13. Functional Linguistics: Robert D. Van Valin, Jr.
15. An Introduction to Formal Semantics: Shalom Lappin. 16. Pragmatics: Language and Communication: Ruth Kempson. 17. Discourse Analysis: Agnes Weiyun He. 18. Linguistics and Literature: Nigel Fabb. 19. First Language Acquisition: Brian MacWhinney. 20. Linguistics and Second Language Acquisition: One Person with Two Languages: Vivian Cook. 22. Natural Sign Language: Wendy Sandler and Diane Lillo-Martin. 25. Computational Linguistics: Richard Sproat, Christer Samuelsson, Jennifer Chu-Carroll and Bob Carpenter. 26. Applied Linguistics: Janie Rees-Miller. 27. Educational Linguistics: James Paul Gee. 28. Linguistics and Reading: Rebecca Treiman. 29. Clinical Linguistics: David Crystal. 30. Forensic Linguistics: Roger W. Shuy. 32. Language Planning: Frank Anshen. Contains over 30 newly-commissioned chapters. Written by an international assembly of leading linguists. Most up-to-date, comprehensive linguistic resource available. Flagship volume for prestigious 'Blackwell Handbooks in Linguistics' series.